Boulder problems are shorter than routes. This one is obvious, but I want you to think about it in terms of the physiological demand of the effort. On a typical sport climbing day, a climber will usually do 5-8 pitches of climbing. These pitches will take, say, 10 minutes each to climb, and will be separated by 20 or more minutes’ rest. In contrast, boulder problems usually take less than a minute to climb, and are separated by just 3-5 minutes rest. This shows us that there is a whole lot more low-intensity aerobic metabolism involved in routes, and a bunch more total volume each day. Boulder problems are sprints; they depend heavily on alactic and lactic metabolism and are separated by greater relative rest periods. Boulder problems are more intense than routes. As I mentioned above, bouldering is anaerobic. It is a 200 meter sprint compared to the 5k run that is a sport route. Each effort at a boulder problem requires more energy per unit time than a route does. Because of this we need to design a plan that includes more intense training with greater rest. This needs to be backed up by a nutrition plan that supports the different style of training. As a final note on this point: boulderers need to stop when it’s time to stop. Training past the point of power decline is counterproductive and is a great way to flirt with injury. Plus, you might actually be getting weaker. Boulder problems are more continuous than routes. Bouldering requires a lot more body tension, core strength, and focus than most routes. We have to build these consideration into all of our training plans. This is a big problem with bouldering on an artificial wall – the footholds are often way too good to force real-world movements. Routesetting should reflect this as much as possible, and your training should include tension sets. Boulder problems are more “skill dependent” than routes. When setting up a training session, you’ve got to make sure to do highly skill dependent tasks first. This means putting technical and hard problems right after the warm-up. Once you’ve had your best goes at these problems, specific skill work is next. This can then be followed by strength sets, hangboard work, and even campus board training. As you move through the workout, remember that the skill requirement of your exercises should be decreasing. Bouldering days involve far less volume and far more intensity than a normal route climbing day. Related to #2 above, you won’t do near as much climbing, but you’ll do way harder climbing. A normal 12a-level climber might do 5 to 8 V3 or V4 moves in an entire day at the crag. That same climber might do five times that many in a bouldering session. Recognizing this consideration is critical so that the climber can avoid injury when transitioning into a power phase. I think this point is a key to looking at successful climbers across the board. 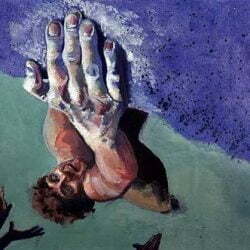 Strong boulderers make strong route climbers – the transition from high intensity to high volume is not inordinately difficult. Building power takes a long time, and I think that’s why route-focused climbers have such a hard time progressing. Work to rest ratios are much different when bouldering versus route climbing. The amount of rest between problems is short, but in relation to how long the problems take, it’s long. By taking longer recoveries, we can see much better power and strength gains each and every session. 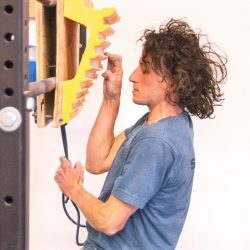 If a boulderer fails to recognize this need, his sessions become endurance “short-route” sessions and are no longer appropriate for bouldering improvement. A rule of thumb: if you’re out of breath and sweating, you aren’t training power. Bouldering is “faster” than route climbing. We move more quickly when the stove is hot. The contact time (the amount of time you are grasping a given hold) for a typical boulder problem maxes out around 2/3 that of a redpoint route and about 1/6 that of an onsight or a route. When you’re trying to convert your bouldering season into routes, this is an important consideration. Most of us will try a given problem more times in a session than we’ll try any section of a route. 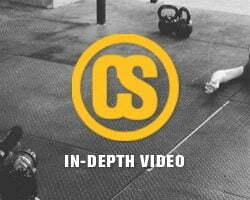 This increases the speed at which we learn, the overload to the specific movements (which speeds up strength gains), and teaches our minds to relax more on hard moves. With these factors in mind, we have to take a good look at what each climber is trying to get out of the sport. It’s clear that we’re looking at two sides of the same coin (ropes vs. pads), but optimizing performance on the boulders requires making some important changes to a climber’s program. For performance bouldering, we virtually eliminate all endurance and power-endurance training, focusing instead on building high levels of strength and power. This is necessitated by the lack of physiological “resources” and adaptation potential each of us has; the more facets of your performance you try to change at once, the smaller those changes will be. 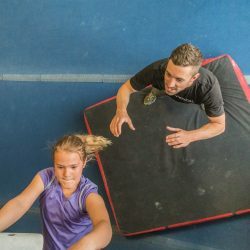 Most of a boulderer’s training will be in the form of bouldering on an indoor wall, which very closely simulates actual climbing. Boulderers also benefit heavily from “special preparatory exercises” which are similar in movement pattern or metabolic demand to actual climbing. They are not really “climbing” but rather partial movements done to increase specific strengths. We use these because in an advanced boulderer, just bouldering doesn’t allow for enough overload to make the climber better. These exercises are nothing new; we’re talking about System wall training, Campus Boards, and some targeted weight training. By using these tools correctly and repetitively, you can actually get better at climbing. Use them wrong, and you’ll just be making yourself tired. A boulderer’s training should be of shorter duration per session than a route climber’s training. When developing maximum power and strength, a long session would be about an hour. I know this seems short…many climbers pride themselves on how long their sessions are. Don’t be one of these climbers.